Have You Ever Wondered Where Halloween Began? It’s a beautiful, cool evening as leaves fall all around. Summer decor has given way to cornstalks, pumpkins and mums, but now mixed with spiders, witches and bats. Ghosts ooze from behind faux gravestones as an eerie soundtrack fills the air. Jack-o-lanterns light the path for trick or treaters to gather as many treats as time allows. Giggles float on the chilly breeze…..
Halloween is one of the most celebrated holidays here in the U.S. We love dressing as someone or something else for the evening and gathering to tell ghost stories and make merry with our family, neighbors, and friends. It is a tradition that we remember fondly from our childhood and enjoy passing on to our kids. But, where did it begin? Why do we deck our homes with spooky things and love to scare and to be scared? Halloween’s roots can be found in the festival of Samhain, a Gaelic word meaning ‘Summer’s End’. According to Wikipedia, Samhain is a Gaelic festival marking the end of the harvest season and the beginning of winter or the “darker half” of the year. Traditionally, it is celebrated from 31 October to 1 November, as the Celtic day began and ended at sunset. This is about halfway between the autumn equinox and the winter solstice. It was a time for celebrating the harvest, but also held great superstitions and fear. Samhain tradition had many deep seeded supernatural practices that were an integral part of the annual festivities. The somewhat fearful people that lived during these ancient days fervently believed that the end of the harvest and the onset of winter also created an unusual opportunity for the spirits of the newly deceased. During the short window of time surrounding Samhain, it was commonly believed that the souls of the dead could return to life and mingle amongst the living. Safeguards were taken against bad fortune brought by the spirits. Lanterns of turnips with frightful faces were carved to light the path. Masks and animal skins were worn as not to be recognized by their recently deceased relatives. They left lavish feasts out to appease any malevolent, hungry spirits. These Samhain practices evolved, tempered by religion, and were introduced to America after the Great Potato famine. Irish immigrants continued to practice fall harvest celebrations in their new country. By the turn of the twentieth century, everyone had joined the party. Adults celebrated the holiday of Halloween with great gusto. Fortune telling, telling of ghost stories and pranks were the activities enjoyed by costumed guests. Decorations were scarier and more macabre. The Beistle Company and Dennison Manufacturing Company created cardboard and paper products of ready made party items. Both companies are still in business today. After WWII, Halloween became a holiday for children with decorations and costumes reflecting the lighter side of ‘spooky’. Today, Halloween is the second most celebrated holiday in the U.S. Last year (2017), 179 million Americans celebrated the holiday and spent 9.1 billion (yes, billion!) dollars! 16% dress up their pets. So this October as you dig the Halloween decorations from the attic or closet, think of those ancient Celtic villagers who started it all. And remember, the crack between the worlds may still be open. Carve that Jack-o-lantern and pick a good costume. You never know who else may be hanging around October 31st. Click link above to view other dolls! First, a little about the past… Feather trees as a Christmas decoration have a rich history. Germany is credited with introducing many of our customs and traditions that we honor at Christmas, and the use of evergreens to celebrate it. Around 1600, the first evergreen was brought indoors and decorated with paper flowers, fruit and gold spangles. Protestant reformer, Martin Luther, is given the credit for lighting the tree with candles to recapture the light of the stars glittering through the evergreen boughs as he traveled home. By eighteen hundreds Germany, the tradition of the Christmas tree had grown in popularity and began to cross borders. Queen Victoria and Prince Albert brought the tradition to England. 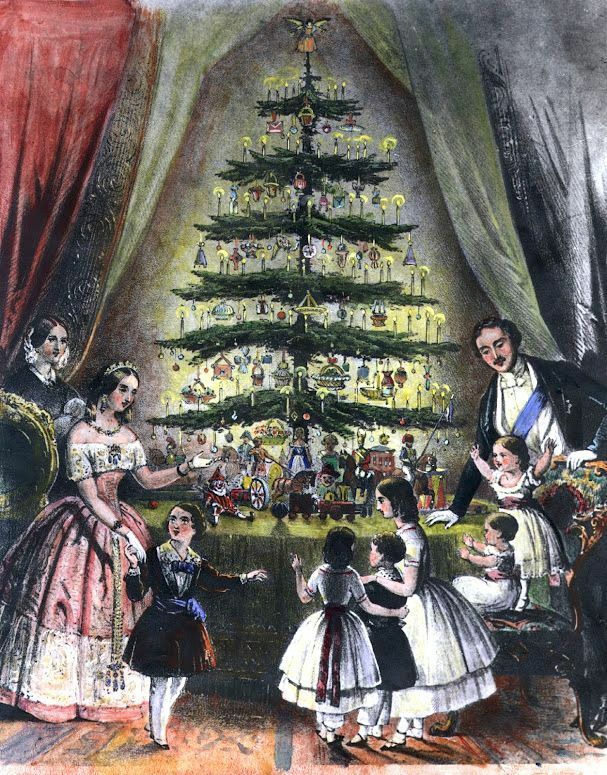 In 1848 an engraving of the royal family gathered around their Christmas tree was published in the “Illustrated London News”. Soon every family in England had a tree decorated at Christmas time. Mid 1800’s Germany found smaller trees less available, so citizens cut the tops from large trees, which stopped their growth and left them useless to the timber industry. Faced with a deforestation problem, the government enacted a law that limited each family to one tree only. Industrious farmers stepped in with a solution and the German feather tree was born. They had an abundance of goose, turkey, swan and ostrich feathers at their disposal. The feathers, dyed green, split and wrapped around sticks or wire created a convincing replica of an evergreen branch. The branches were drilled or wired to a central ‘trunk’. Families began making the trees to sell at Christmas markets. By making the feather trees, along with paper and spun cotton ornaments to adorn them, these cottage industries helped make them a popular alternative to cutting a live tree. As Germans immigrated to America in the late nineteenth century, they brought their feather trees with them to remind them of home. Immigrants in Pennsylvania and Texas introduced their trees and traditions to their neighbors and Christmas celebrations spread, along with the decorations for the home. Their popularity grew at the turn of the twentieth century, as an environmental movement against the annual harvest of Christmas trees spread across the U.S. Department stores, such as Woolworth, began to import feather trees and decorations to the American market. 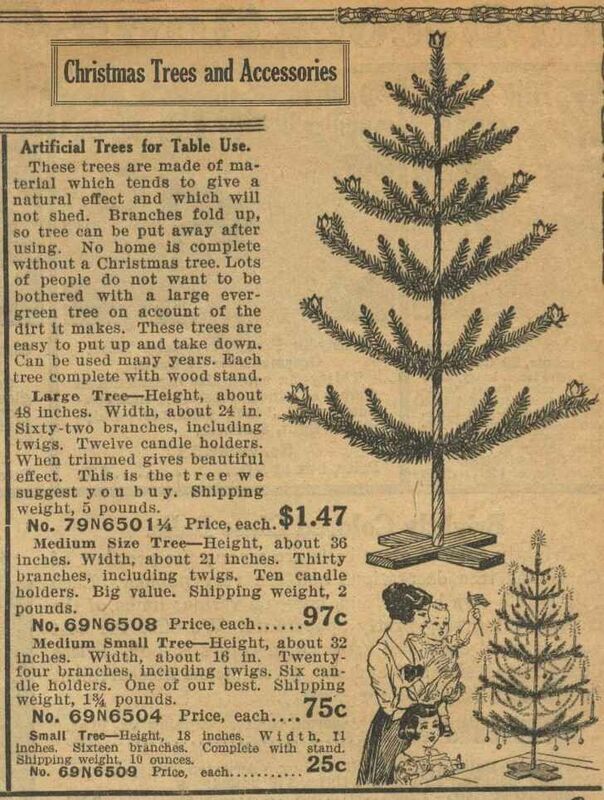 In 1913, Sears and Roebuck catalog offered traditional green trees and ornaments for sale to their customers. In the 1920’s blue, red, yellow, pink and bleached white trees were also sold. The trees were popular through WWII. After the war, feather trees were replaced with other artificial trees. 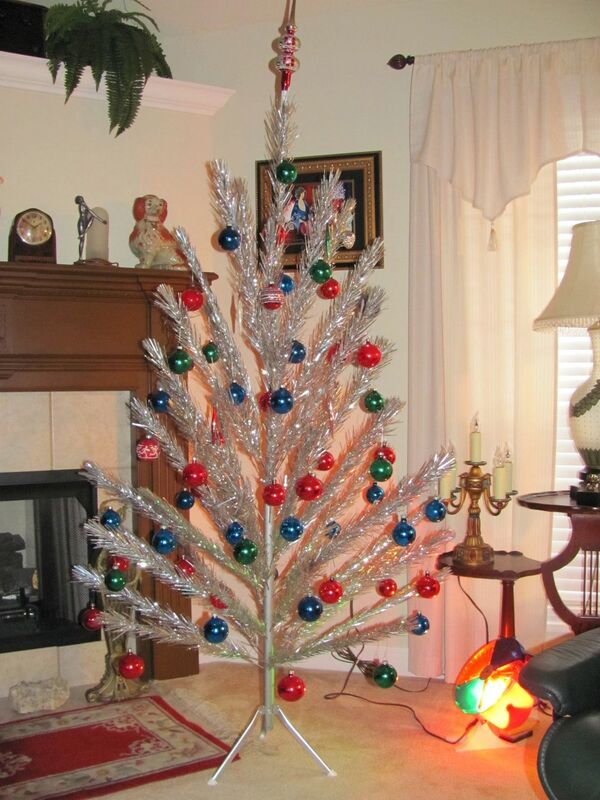 Who can forget the splendor of a revolving aluminum Christmas tree and it’s spinning color wheel! Traditions changed and the feather trees were relegated to attics and closets. Today, examples of vintage feather trees, along with the decorations, can still be found in antique stores and flea markets. They are collected, treasured and lovingly preserved. The twenty first century has seen a revival of the German feather tree. Renewed interest in vintage and antique Christmas decorations has brought the feather tree back into popularity. New trees to hang these lovely and fragile ornaments on are now being produced. Ornaments and collections of all kinds can be displayed on a feather tree. The trees are sturdy and made of the many colors of the rainbow. I collect vintage ephemera such as tiny new baby and wedding gift cards. They look so sweet tucked in the branches of a feather tree. Think how special a feather tree, used as a money tree, would make the decorations of a wedding shower. For a new baby’s nursery, adorned with vintage baby shoes and booties or the lovely little gift cards from the early twentieth century. The trees have unlimited uses as displays for treasured items or look wonderful unadorned. Used in place of a floral centerpiece on a dining room table, they bring a fresh, modern vibe. A grouping of three of varied heights makes a great display. One of my favorite trees is made from dyed black goose feathers. I love decorating it for Halloween. The vintage ephemera or other small Halloween tidbits, sprinkled with a few spiders, makes a perfect table top arrangement. From the first time I laid eyes on a feather tree, I have wanted to learn the techniques to make my own. I now hand dye white goose feathers many colors to go with every occasion. The art of making a German feather tree brings with it a connection to those first farmers who, out of necessity and opportunity, created these beautiful trees. I love keeping these techniques alive, but giving them my own twist. Thank you for taking a few minutes from your day to let me tell you about these age old treasures! This is my world of nature, imagination and make believe. I am a doll maker and lover of childhood; the simplicity and magic that kids approach the world with. One place I find it is in my woods. According to Wikipedia, there are twenty two shades of green in nature. I’m certain that all twenty two are present out my window this morning. Most folks associate Ireland with verdant green surroundings, but West Virginia is just as green. The woods draw you in and envelop you with a soft coolness. The smells are earthy, sweet, spicy and fresh as your legs brush the foliage. The oxygen is richer. The trees are alive with birds singing to greet the day, hoping for a seed or insect to catch their eye. This time of year they are calling for a mate. I can see how Rip Van Winkle laid down on the soft moss and slept time away. It is a place where Mother Earth holds you to her bosom. I create dolls and feather trees inspired by my woods along with memories from childhood, sprinkled with inspiration from all the children’s book illustrations that I love. I hope you enjoy our journey into Faerywood. Children of all ages are welcome!